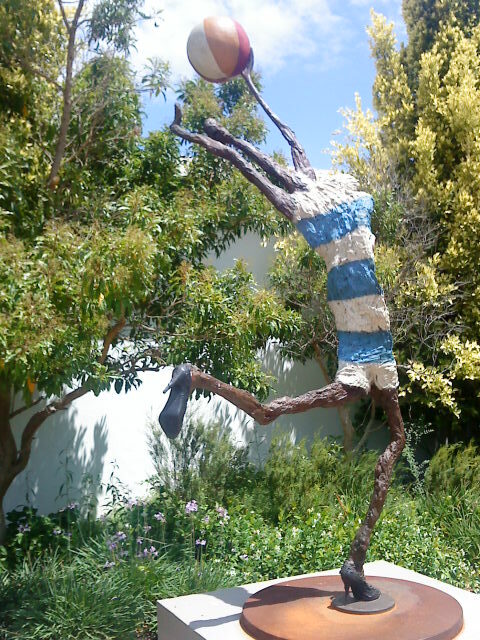 This photo is of a sculpture outside The House of JC le Roux winery, Stellenbosch, South Africa. On Wednesday it was my forty seventh birthday. My husband took me to this venue for a wonderful tasting of “champagne”/ sparkling wine. When I saw this artwork something jumped in my soul. It is a wonderful artwork. One feels young, playful and full of life when you look at her. This work spoke and moved me deeply. For me she is dancing with a ball in high heel shoes. My understanding/interpretation of this sculpture is that it a reminder about how we can life our lives. It spoke to me about living life to the fullest, maybe even sometimes a little inappropriately. I mean after all, who wears high heel shoes and play with a ball in something that looks like a 1920’s bathing suit? The answer I came up with is a person who understands that life is precious! Life is for living and my only responsibility regarding life, is to live it. My responsibility is it to do so with all my energy, conviction and passion in ways that will be life-giving to myself, others and the earth. I hold onto the same deep sense of freedom and acceptance, which I see/feel in this sculpture. I have peace when I embrace life with all its challenges and remind myself that life is not about who you are, what you have or your achievements, but about the effects you will have on all that you touch: physically, emotionally, spiritually, intellectually, financially and any other way you engage with others, yourself and the environment. Over recent years I have come to a place and space where I define contentment not as being content with what I have, but rather with what I do not have. This does not mean that I do not have any ambitions or dreams left. It only means that I live in the here and now for today with all that I have to the best of my ability. Ps. I do not mind sharing my age, after all, age is just a state of mind.